The discovery of fire completely revolutionised the food system, providing early humans access to safer food, a way of preserving edible material and nutrients that may have otherwise not been easily absorbed in the gut. Similar cultural advances have been achieved, for instance, through canning, the discovery of vitamins and microwave heating, all of which have changed the food system in one way or the other to the betterment of humanity. potential future breakthroughs to get insight into hurdles and challenges early and pave the way for a smooth and efficient transition to new ways of ‘doing things’. 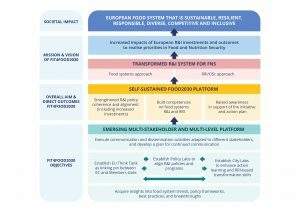 FIT4FOOD2030 partners have analysed past breakthroughs in the food system, as well as looked at potential upcoming breakthroughs that can be taken advantage of in an effort to revolutionise the food system once again. Find the full report here.